This famous, but fraudulent, photo captures an image of the Cottingley Fairies reported by two English girls in the 1920s. The story of the fairies was supported by the writer Sir Arthur Conan Doyle, who believed in the hoax until the day he died. Fortean Picture Library. During the 1920s, British Spiritualists and theosophists endorsed a set of pictures taken, supposedly, of fairies by two young girls in the village of Cottingley. The pictures were taken by seventeen-year-old Elsie Wright and her cousin, Frances Griffiths. 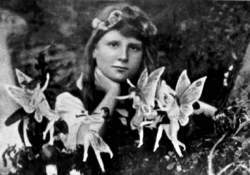 The first picture, taken in July 1917, showed Elsie with the fairies. A second picture was taken a few months later. The pictures were put aside for several years, then eventually fell into the hands of Arthur Conan Doyle (1859–1930), who in 1919 was gathering material to write an article on fairies. In 1920 he commissioned Edward J. Gardner (d. 1970) to investigate the pictures. Finally convinced the pictures were what they purported to be, Doyle wrote an article for the December 1920 issue of Strand magazine, with a follow-up in the March 1921 issue. The article set off a storm of controversy, and Doyle was forced to defend himself and the pictures. The articles became the basis of his 1922 book, The Coming of the Fairies, in which Doyle wrote about his belief that fairies were a means of shaking up new secular worldviews. In this effort he was joined by theosophist and medium Geoffrey Hodson (d. 1983), who in 1925 published his own argument for the existence of fairies and defense of the photographs, Fairies at Work and Play (1925). In 1945 Gardner would write a book describing his involvement in the incident. He, like Doyle and Hodson, would die believing the photographs were real. Skeptics attacked the photographs almost immediately. To most, the photographs appeared to picture flat figures rather than living, three-dimensional figures. Defense of the photographs depended on the integrity of the girls and theirfamilies, and the inability of anyone to produce the actual mundane source of the fairies in the pictures. The pictures also passed the examination of photography experts of the day. Gardner’s death in 1970 became the occasion of further attention to the Cottingley photographs, which—in spite of efforts by skeptics to destroy them—would not go away. A breakthrough came in 1976 when The British Journal of Photography began to run a series of articles by Geoffrey Crawley, which thoroughly reviewed the pictures. The ninth installment of the series dropped the bomb: a letter from Elsie in which, for the first time, she admitted that the pictures were a hoax. She had perpetuated the hoax in part because she felt sorry for Doyle, who had committed himself to defending the pictures. In the end, the representations of the fairies in the pictures could not be located as they had been drawn by Elsie, inspired in part from a book belonging to Frances, Princess Mary’s Gift Book. While the Cottingley fairy hoax is common knowledge today, thirty years after the exposure, the three books that backed the story remain in print and continue to be used in support of the existence of a fairy world within contemporary spiritualist and theosophical circles. Crawley, Geoffrey. “The Astonishing Affair of the Coming of the Fairies.” British Journal of Photography 24 (December 1982-April 1983). Doyle, Arthur Conan. The Coming of the Fairies. 1921. Reprint, New York: Samuel Weiser, 1972. Gardner, Edward l. Fairies: The Cottingley Photographs and Their Sequel. London: Theosophical Society, 1945. Princess Mary’s Gift Book. London: Hodder & Stoughton, 1914.